Polish chemical company Grupa Azoty reportedly plans to invest around €1.4 million in a graphene production line this year. The line is to be located at the group’s plant in Tarnow, Poland, and will have an output capacity of around 1 kg of graphene per week. The Grupa Azoty spokesperson stated that company representatives have been in talks with various entities interested in cooperating and using graphene in their manufacturing processes. The line’s output is intended for sales both in the domestic and foreign markets.GA has already acquired the necessary technology to produce graphene from the Institute of Electronic Materials Technology (IEMT), a state-run research centre based in Poland, and the Lodz University of Technology. According to GA, it is not the only Poland-based manufacturer that aims to invest in graphene production. Polish company Graphene Solutions is planning to invest at least €1.14 million to launch production of graphene components to be supplied to yacht makers. The funds are to be provided to the company under the Innochem programme which is financed by the European Union. Another local producer, Advanced Graphene Products (AGP), has teamed up with a group of researchers from the Lodz University of Technology to jointly produce flexible graphene components that will also be used to make yachts. Under the plan, the parts will be made from high strength metallurgical graphene, an enforced material patented by the Lodz-based firm. The Polish group sees graphene as a chance to reinvigorate its sales, as Grupa Azoty is to add graphene to its product range amid lower financial results for the first nine months of last year. From January to September 2016, the group reported revenues of some PLN 6.6 billion (€1.5 billion) which represented a decrease of about 14% compared with PLN 7.5 billion (€1.71 billion) in the same period a year earlier, according to the latest available financial data from Grupa Azoty. 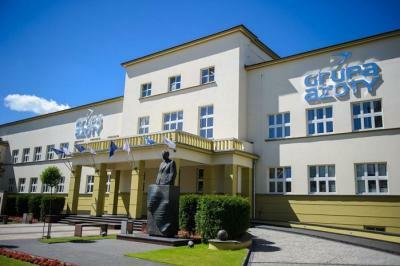 To expand and upgrade its product range, Grupa Azoty is planning to invest more than PLN 1 billion (€228 million) at its production facility in Tarnów, and a further PLN 6 billion (€1.37 billion) at its other manufacturing subsidiaries, as indicated in the group’s business development strategy for the years 2013 to 2020.